You run an engineering company that has a workforce of 1000 employees. You’re participating in a tender to provide some components for a new submarine project. You run a financial services firm with 5000 employees. Your ability to compete is largely reliant on having a talented workforce. Why would you want to identify skill gaps in these two scenarios? In scenario 1 it’s critical that you know the skills needed to deliver the components and whether your people have those capabilities. It’s too risky submitting a bid and quoting pricing without fully understanding this. In scenario 2, to continue to be competitive you need to be planning your workforce and skill requirements over the next 3 years. With the normal movement of staff in an organisation this size, recruiting as roles are vacated isn’t good enough. If perfectly suited candidates can’t be found, it puts the organisation at risk of leaving roles vacant or filling them with semi-skilled and inexperienced people. It’s much better to know where your gaps might be in 1, 2 or 3 years time. How to identify the skill gaps? To start with you need a list of the role types within your organisation. This isn’t the same thing as having a listing of every position on your org chart. You want to simplify the process by grouping together like roles. If you have both a “Customer Service Officer” and “Customer Service Representative” in different parts of the organisation, they almost certainly require a very similar skill set. If this is the case, you can list it as one role type. Once you have this list, it’s a valuable resource in itself. It’s ideal if you can find out all of the relevant skills a person has, not just those for their current role. To do this, create a survey that makes it easy for your people to respond. This essentially means you need to keep it short and not ask the same question twice. To achieve this, the survey should group together each of the major role types. Use the list you created in step 2 as your starting point for this. Let’s say you have an engineering group within your organisation. It may have a number of different role types within it, but there’s probably common skills across many of them. For example, many of the role types may require people to be skilled at “Electrical Schematics”. Rather than listing skills more than once under each relevant role type, list them once under a common group heading such as “Engineering”. With the survey designed, you are now ready to ask your workforce to respond to it. The size of your organisation and the number of roles will determine how you go about doing this. It’s a good practice to communicate to survey participants to explain why you are asking for their response and what will happen with the information. If you can avoid it, don’t do this manually – see the comment below about technology. The results need to be compiled in two ways. For each person, you need to know what skills they have. For each skill, you need to know which people have it. 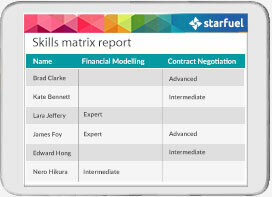 Skills audit is a process that can be used to identify the skill gaps in an organisation. The outcome is a training needs analysis that identifies where training is needed. If you don’t know what a competency is, the is a good place to start. It explains the difference between technical and behavioural competencies.